Calamintha arkansana of Michigan Flora. 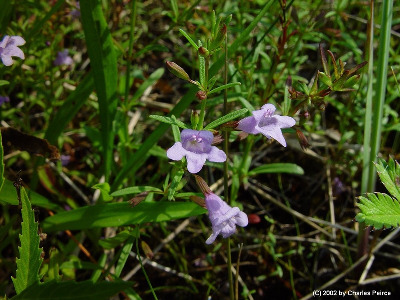 Locally abundant in moist or springy flats and hollows or hummocks (depending on high or low water levels) among dunes and on rocky shores or edges of thickets, seldom far from the shores of Lakes Michigan and Huron, although rarely at inland lakes. 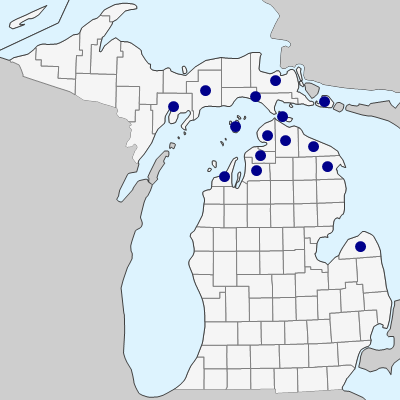 From calcareous places in northern Michigan, ranges mostly south and southwest, to Texas. This species is also known as Calamintha arkansana (Nutt.) Shinners or Satureja arkansana (Nutt.) Briq. It is sometimes included in Clinopodium glabellum (Michx.) Kuntze, a species with pubescent nodes and no stolons. Clinopodium arkansanum produces leafy stolons with rounded leaves quite unlike the linear leaves on the middle and upper parts of erect shoots. This is a very aromatic little plant, the new shoots early in the season easily detected when one crushes them under foot while looking for, say, Primula mistassinica or Viola nephrophylla in the same habitat. It ordinarily reaches the peak of flowering late in July, when it is especially attractive with flowers larger than the leaves. Plants with pure white corollas occur with normal purple-flowered ones, and corollas of intermediate shade may be found in the same populations. MICHIGAN FLORA ONLINE. A. A. Reznicek, E. G. Voss, & B. S. Walters. February 2011. University of Michigan. Web. April 19, 2019. https://michiganflora.net/species.aspx?id=1539.